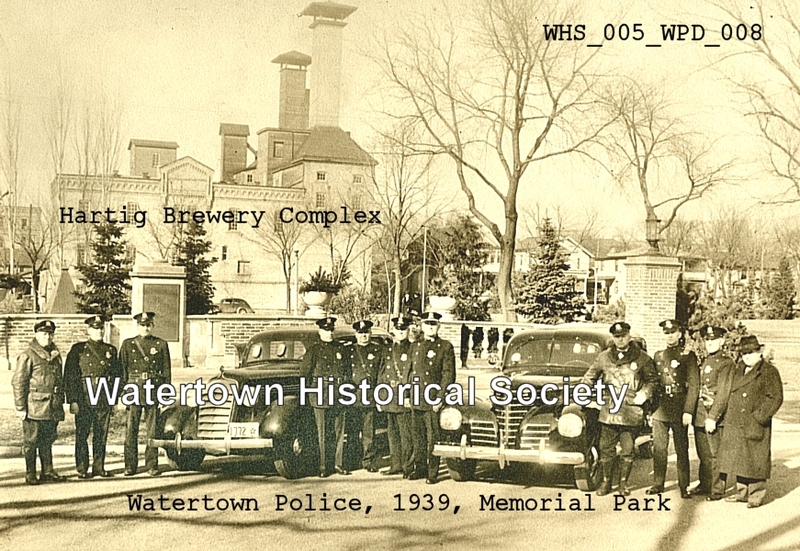 Memorial Park proposed for “brewery lot.” Current location of City Hall, Police & Fire depts. 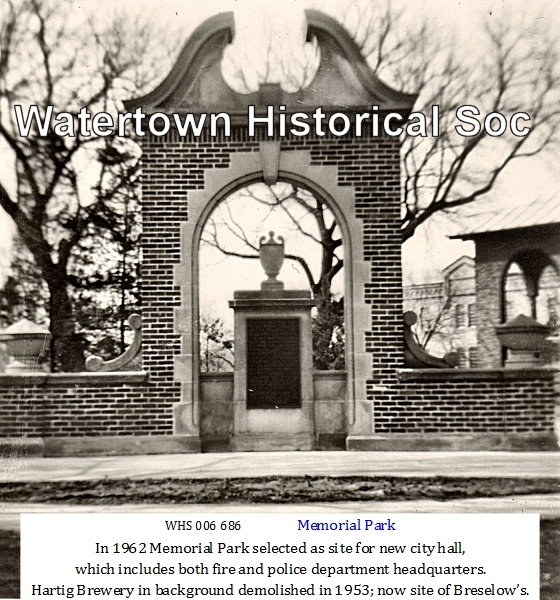 Watertown’s Memorial Park was under discussion at the city council meeting. The memorial park proposition will soon become a reality. 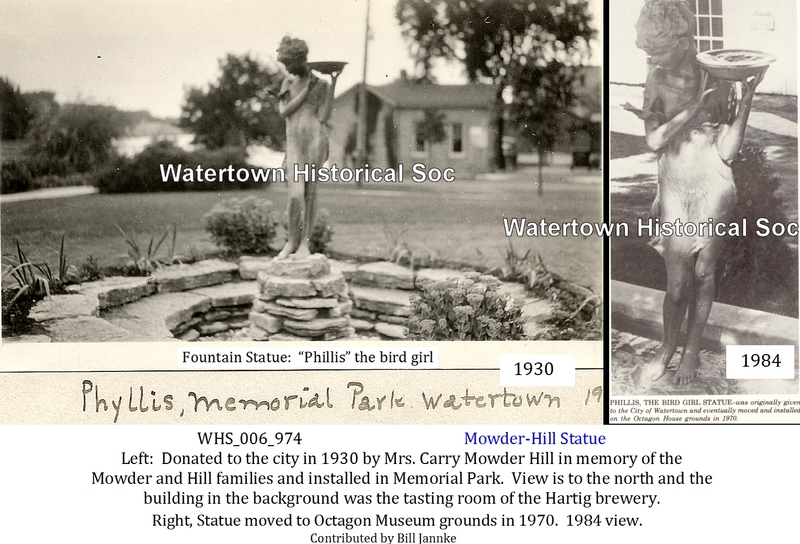 The Memorial Park has been under discussion for some time and the city has already purchased the tract of land on Rock River between Cady and Jones streets known as the "brewery lot." Properties on the east end of the block, which includes the tract owned by the city, and the property on the southeast corner of the tract, however, are still owned by individuals. It has been proposed to purchase these properties and include the entire block in the memorial park area. This matter was taken up by the council last evening and there seemed little opposition to such a purchase. Members of the park board appeared before the council and spoke in favor of the establishment of a memorial park to include the whole block between Rock River and North Second Street from Cady to Jones streets. Those who appeared were Owain T. Hughes, Mrs. Eli E. Fischer and G. M. Gahlman. A number of aldermen also strongly endorsed the idea and the building and grounds committee and the city attorney were instructed to go ahead with the proposition and purchase the additional property. The prices for the property include $6,500 for two houses and lots on which the houses are located. These are owned by Mrs. Mae Davler. The sum of $2,500 is asked for two lots owned by Mrs. Sophie Delmel and $7,500 is asked by Reinhold Neumann for the house and lot owned by him. Ex-Mayor Wertheimer also appeared before the council and stated that if the park plan be put into a reality that a bandstand be erected on the premises. He spoke strongly in favor of the proposition but stated that he was not there to dictate the council's notion, but rather to present his viewpoint and that the council should be allowed to do as it saw fit. More people here are familiar with the old beer cellars that are located under Memorial Park, which was once the site of the Fuermann brewery. After the brewery was destroyed and remained only a ruin and an eyesore the old cellars came into partial view and boys playing on the lot used them for hideouts. When the city acquired the property and the development of the park began one of the first tasks was to fill in the old passages. A part of the park area caused trouble for years. A lot of old refuse, tin cans, etc. had been used to fill in a portion of the place and over the years a section of it began to cave in. This caused a great deal of trouble for city and park board officials and the great memorial arch, which originally stood at the southwest entrance of the park, had to be repaired and replaced, as the settling ground caused it to crack and break. After repairs had been made several times and a portion of the original arch had been removed entirely the entire structure was torn down and rebuilt at the southeast entrance of the park where it now stands. That section of the park had never been used for cellars and consequently provided a better location for such a heavy structure as the arch. Plans for the dismantling of the present World War II honor roll in Memorial Park and working out a system for a permanent record of men and women who served in the war are to be taken up at a meeting of a city council committee and representatives of the Pitterle-Beaudoin post of the American Legion, the Beaudoin-Draeger-Koehler post of the Veterans of Foreign Wars, and the Watertown garrison of the Army and Navy union to be held in the near future. The present honor roll is to be torn down completely under the plan. But what other means will be used to make the records permanent are still to be worked out. The honor roll has served its purpose and has now reached the point where it is deteriorating and must be done away with if it is not to stand as an eyesore to the community; the city council was told last night. Some veterans have already protested the present state of the roll. Image Portfolio 1950s portfolio of Images Fair Day held on N Second St., Memorial Park area. After flying over the city to announce his arrival, Santa Claus will land at the Watertown Airport next Friday afternoon at 2:20 o’clock, make a quick trip to the recreation building and join the parade which is scheduled to get underway without delay soon after. The Candy Stick Palace where Santa will make his headquarters will be placed in Memorial Park. 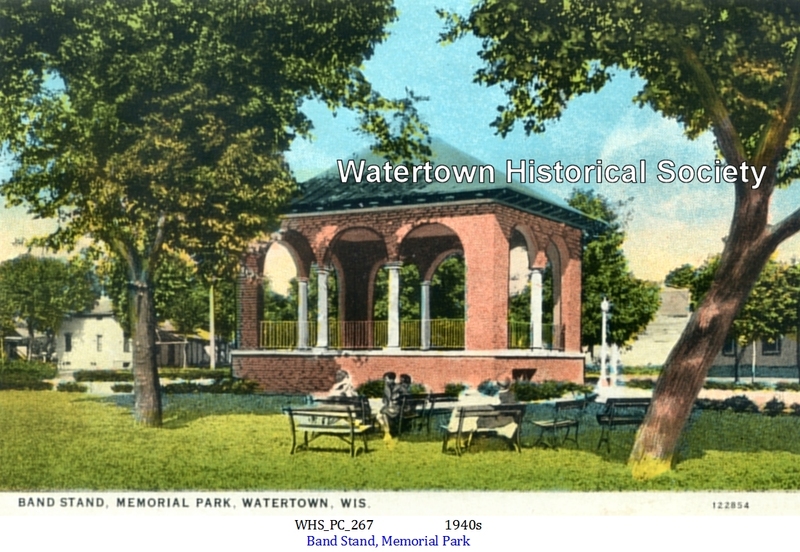 First plans were to locate it in Madison Street on the Bank of Watertown parking lot but it was decided Memorial Park will offer better facilities and that is where it will go up next week. The parade next Friday will start from the recreation building at 2:30 p.m. and will go through Main Street and wind up at Memorial Park. 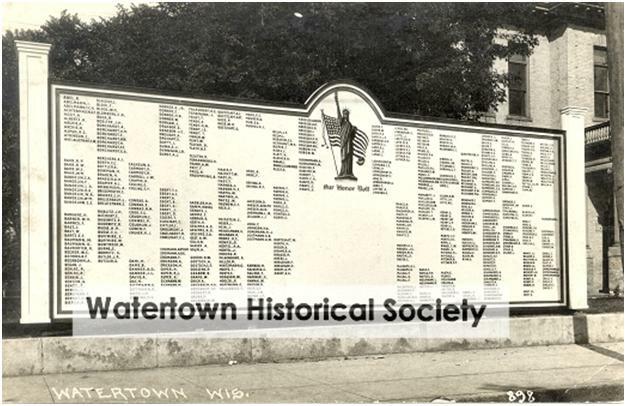 The Watertown Municipal Band will join the parade as will the Watertown High School band and 1961 homecoming queen, Karen Ahlhorn and her court. The Candy Stick Palace will be open every night on which Watertown stores are open, from 6:30 to 8:30 o’clock as well as every Saturday afternoon from 2:30 to 5 o’clock, and Santa will be there at such times to greet children, give each one a favor and camera service will be available for those who wish to have their picture taken with Santa Claus.